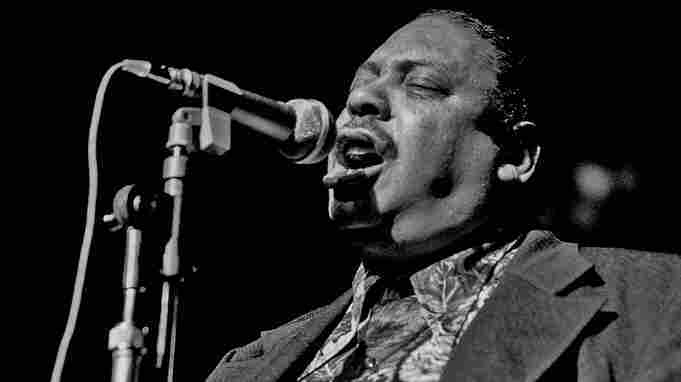 The Big Man Behind 'Shake, Rattle And Roll' Six feet tall, weighing in at 400 pounds and in his 40s when stardom hit him, Big Joe Turner is behind a load of rock 'n' roll hits. His hardest-hitting singles have been collected on a new compilation, titled Big Joe Turner Rocks. 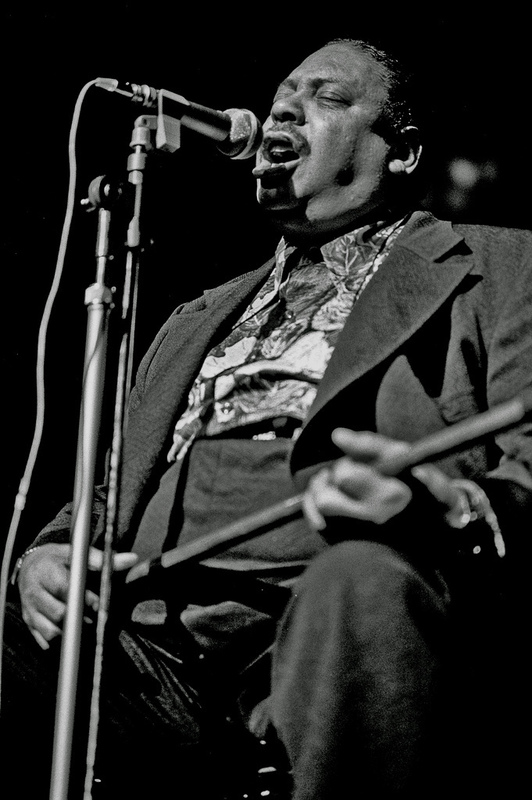 No figure in the history of rock 'n' roll is more incongruous than Big Joe Turner. Here's how it would work, night after night in Kansas City. The band onstage would start a tune, introduced by the piano player, Pete Johnson. After the first chorus, the bartender, a big guy just out of his teens, would start singing blues. He didn't really need a microphone, but he'd work his way to the one on stage anyway and carry on for a few more numbers. Then he'd walk back to the bar, pick up the bar towel and continue pouring drinks for the customers. Joe Turner was born in 1911. He went to work to support his mother when his father died in the early 1930s, but he'd already been sneaking into clubs and doing guest stints with the bands in places like the Backbiter's Club, the Hole in the Wall and the Cherry Blossom. His big break came when Pete Johnson, already a local favorite, gave him a regular gig at Piney Brown's Sunset Café; it was there, in 1936, that John Hammond, in town to sign the Count Basie band, heard the duo. He told jazz fans in New York about them, and soon they had a gig at the Famous Door on 52nd Street. In 1938, Hammond included them in his famous Spirituals to Swing concert, and in so doing ignited the boogie-woogie craze. The two went into the studio to record one of their most popular numbers, "Roll 'Em Pete." Those verses — the girl up on the hill, the eyes shining like Klondike gold and so on — would return in song after song, rolling, as he'd also say, like a big wheel in a Georgia cotton field. Turner was illiterate, but he also possessed a library of what blues scholars call floating verses; his was second to none. And, of course, there was that voice. In April 1951, Joe Turner had an unfortunate gig at the Apollo Theater in Harlem, singing with Count Basie's band as a last-minute substitute for Jimmy Rushing. The audience laughed as he missed cues, but among the crowd was Atlantic Records' Ahmet Ertegun, who'd been trying to find Turner to sign him to his label, which was just emerging as a rhythm-and-blues powerhouse. He found Turner drowning his sorrows in Braddock's Bar afterwards and offered him $500 for a session. They only recorded one number that time, but two years later, Turner tried again in New Orleans and recorded a smash, "Honey Hush." The song rocketed up the R&B charts and even saw some pop action, which was unusual in 1953. Turner's next stop was Chicago in October; there, with Ertegun and his new business partner Jerry Wexler in charge of the session, they tapped a young guitarist who'd just moved north from Mississippi, Elmore James, to play on the session. But it was a 1954 session right at home in New York, in Atlantic's offices — with the office furniture pushed against the walls to allow a hand-picked band of New York's best rhythm-and-blues musicians to set up, and Ertegun, Wexler and the song's arranger, Jesse Stone, singing backup vocals — where Turner, at the advanced age of 42, made rock 'n' roll history with "Shake, Rattle and Roll." The song was recorded by Bill Haley almost immediately and Elvis Presley somewhat later. Although they didn't use some of his more colorful verses, their recordings ensured that "Shake, Rattle and Roll" became one of the first rock 'n' roll standards. Improbable as it seems, Big Joe Turner was a star, and he had star billing on the various rock 'n' roll revue tours he joined. He even appeared in a 1956 movie, Shake, Rattle and Rock, where he split the music with Fats Domino. That was the same year that gave him his last big hit with an old blues standard, "Corinne, Corrina." The backing group is the Cookies, who'd soon join Ray Charles and become the Raelettes. Atlantic stuck with Big Joe Turner for a couple more years, but eventually they parted company. He never stopped working, though, and died in California in 1985. I saw Turner perform in New York in the early '80s. He was living in the same apartment building as my friend Brian, and one day as we were headed back there, Big Joe Turner was out front doing his daily exercises. Brian offered to introduce us, and as I shook Big Joe's big hand and said, "It's an honor to meet you." He looked me straight in the eye and said, "Yes, it soitainly is." I gotta say: It soitainly was.